The Slab & Condominium Moisture Control & Ventilation (MCV) models offered by Coastal Dry Home are aesthetically designed with whisper quiet technology for living quarters. Each uses only 31 watts of electricity and can condition an area of up 2,000 sq. ft. A dedicated 6” vent through the wall to the outside is required. The Slab & Condo MCV models follow the same mechanical processes of moist air Expulsion, fresh, clean air Replenishment and whole house Ventilation as their crawl space and basement cousins. These sleek units are installed in the lowest level of the residence and are sensor controlled to automatically adjust ventilation and achieve optimum indoor air quality while preserving energy efficiency. Home and Condominium owners have used the Slab & Condo MCV models with great success in reducing moisture levels and the various undesirable consequences of damp indoor air. The tamper-proof hard-wired model has been used in HUD projects and public housing. These have also been installed by managers of rental and vacation properties across the country to minimize the occurrence of mold and moisture-induced structural damage, creating safer, healthier living spaces and providing a layer of defense against legal issues that could potentially arise from their inferred negligence towards addressing these risks. 2. AC - For homes consistently running air conditioning for more than 6 hours. The unit will create conditions so as not to put a strain on the AC system. 3. 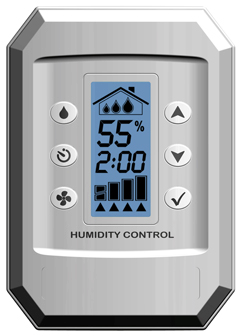 Vacant - For times when the home will be empty for 5-7 days.Computerized sensor evaluates the ventilation and replenishment process, continuously assessing changes in relative humidity, temperature and overall trend patterns. > Height: 23", Width: 9.5", Depth: 5.5"
> Capacity: 2,000 sq. ft.
> Warranty: 8 years on fan and cabinet; 4 years on electronics. Contact Us for More Information on the HVC-SCH. *Condo Owners - Be sure to consult your Condominium Association prior to purchasing or attempting to install this unit as it must be ducted and vented through an exterior wall in order to expel moist indoor air and toxins. Call us at 843-314-9195 for pricing as these are usually bulk orders and the units are typically installed by property management employees. Note that the tamper proof model must be hooked up by a licensed electrician. **Apartment Tenants and Rental Property Occupants - This unit must be ducted and vented through an exterior wall in order to expel moist indoor air and toxins. Do not purchase or attempt to install it without expressed and explicit written consent from your Property Manager and Building Owner. A Licensed Electrician must complete the electrical hookup of this unit.